This Page will describe the functionality of the system and the different modules. The programmed functionality is very broad and very extensive and can easily compete with the professional systems out in the market today. The big difference however is that the OpenMotics system is fully open, all information (source code, schematics, Communications protocols, PCB's etc) is available and it only costs a fraction of the professional systems. Another important aspect is that the OpenMotics system already exists for 9 years, it is already being installed in many apartments, villa's and industrial buildings before we decided to make it fully Opensource under the OpenMotics brand. The OpenMotics system is extremely stable and almost bug free (fully bug free doesn't exist and we're also human being so please allow us to make a mistake from time to time :)) Quality is extremely important for us and much more important than quantity, we only have very happy customers today and that's the way we want to keep it so please don't feel offended if we cannot honor all feature requests. Nevertheless, please sent us all ideas and feature requests to info@openmotics.com, this is always highly appreciated. Below we give you a listing of all possibilities. Please note this listing is not complete and on a daily basis, functionality is added. OpenMotics has created a fully functional multi-tenancy cloud which makes your installation world-wide accessible (cloud can be disabled if no cloud functionalities are needed). The OpenMotics cloud can be used as an option and is a paying service. We always try to keep the cost down but we also aim for a very high security and availability. That's why we've decide to host our cloud service in a professional data-center by a professional hosting company. Store Mode: Typically, a store motor has 3 connections (1 neutral and 2 phases, 1 phase to go up and the other to bring the store down). Because the 2 phase cannot be activated simultaneously to avoid short circuit and destroying the motor, in store mode, only 1 phase of the 2 can be activated. This firmware protection is activated per Output (Relay) module allowing 4 store to be connected. Normal Mode: All outputs (8) of an output module can be used in any combination. NO (normally Open) as well as NC (normally closed) switches/sensors can be connected, each input can be individually programmed. Maximum 240 inputs per system. Is my system compatible with Openmotics? See Heating Compatibility pages. Each thermostat has 1 linked temperature sensor to measure the room temperature. Each temperature sensor has a programmable offset temperature. 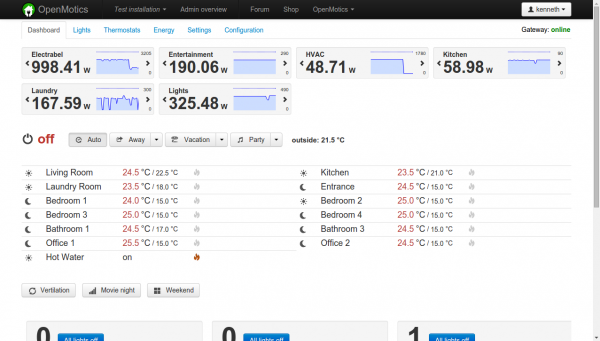 Each thermostat has its own set of PID parameters. PID parameters are used to tune the behavior of the room temperature to avoid overshoot and program how fast a room must be heated. Vacation mode: Each individual thermostat can be programmed with a vacation temperature setpoint. When vacation mode is selected, all thermostat will keep the vacation temperature for all rooms till this mode is deselected. Party mode: Each individual thermostat can be programmed with a Party temperature setpoint. When Party mode is selected, all thermostat will keep the Party temperature for all rooms till this mode is deselected. Away mode: Each individual thermostat can be programmed with an Away temperature setpoint. 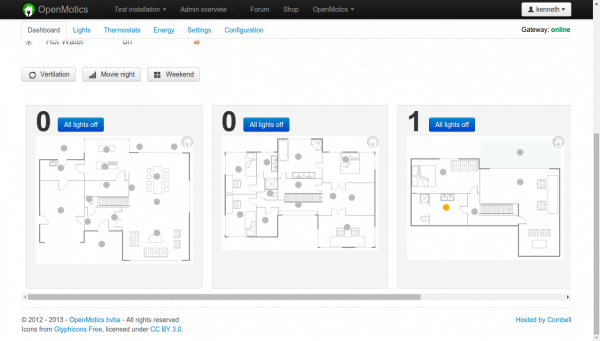 When Away mode is selected, all thermostat will keep the Away temperature for all rooms till this mode is deselected. Programmed Timings: Each individual thermostat can be programmed with individual timings and setpoints for every day of the week. When the thermostat is in automatic mode, the programmed timings and setpoints will be used. Boiler: Timings can be programmed to switch on/off the warm water boiler. Also the status of those outputs can be programmed when in Party, Away or Vacation mode. Ventilation: Timings can be programmed to switch on/off the ventilation. Also the status of those outputs can be programmed when in Party, Away or Vacation mode. The OpenMotics system can be equipped with maximum 4 Temperature Modules. Each temperature module can connect 8 sensors. In total, the system supports maximum 32 temperature values, 32 humidity and 32 brightness values. OpenMotics has designed its own power modules to actively measure power consumption of individual power circuits. Each Power module has 8 inputs. On each input, 1 CT can be connected. A CT will be mounted around the power cable to measure the current. Each power module has 1 phase (110-230V) power input. The goal of the power modules is to measure individual electrical circuits, to see the real time data in the cloud as well as the historical data. Also the power consumption (Real time as well as hystorical) in Euro/USD is available in the OpenMotics cloud.